The Austin Police Department Training Academy is a state of the art training facility located in southeast Austin, near the airport. There are classrooms, gyms, a firearm range, driving track, and the entire Training Academy staff housed on the academy grounds. All police cadets will train at this location for the duration of the academy, but will not live on site. Training hours are typically Monday – Friday from 7 a.m. – 4 p.m. but occasionally nights and/or weekends are required in lieu of day shifts, depending on the curriculum. The police academy is a mentally and physically challenging undertaking but our certified training instructors are ready to set you up for success – you’ve just got to get yourself here and give us your best effort. If you know that you would make a great police officer and you’re up for the challenge, read through the Regular and Modified Academy information below to learn about upcoming academy classes, the minimum requirements for each academy, and how to apply. Police officer candidates who have no law enforcement experience, or who do not qualify for the Modified Academy, must attend a Regular Academy class. The Regular Academy is comprised of approximately 8 months of training and classes are held 2-3 times each year. Upon graduation, newly appointed officers are placed into a 12 week Field Training Program with a certified Field Training Officer. After successful completion of the Field Training Program, the officer is assigned to a permanent patrol shift and will report to a Corporal and Sergeant. Visit the Career Paths page to learn about our specialized units and opportunities to promote. View the Hiring Process page of our website for a list of minimum requirements and the link to apply. * Actively employed with at least 3 years of active service as a licensed police officer for a municipal, county, and/or state law enforcement agency. School/university, Federal, and Military police experience will not qualify for the Modified Academy. * Must hold a current peace officer license from the Texas Commission on Law Enforcement (TCOLE). Out of state applicants without a TCOLE license must obtain their license at least two weeks prior to the start of the academy by following TCOLE established guidelines (see below). All out of state applicants being considered for a Modified Academy must complete the TCOLE Out of State Application process in conjunction with our own hiring process. Please note that our minimum qualification standards for years of service and type of agency are more stringent than that of TCOLE. 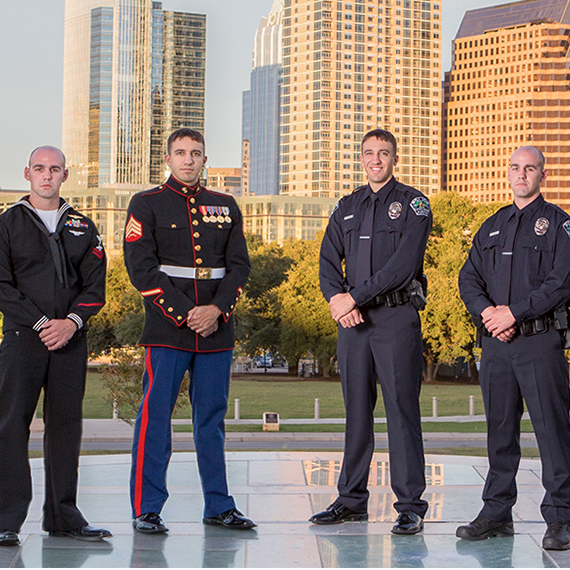 You must meet our minimum qualifications and complete the TCOLE Out of State Application process to qualify for the Austin Police Department Modified Academy. Please contact TCOLE at (512) 936-7700 to find out more information about what is required for their application. If you find that you are not eligible for the TCOLE Out of State Application process, then unfortunately you are not eligible for the Austin Police Department Modified Academy. All out of state applicants must complete the entire TCOLE Out of State Application process, including passing the state licensing examination, at least two weeks prior to starting the Modified Academy. Visit the TCOLE Out of State Process page for more information. The three major components of the academy are: Physical Training, Academics, and Skills, and they are all equally important. Click 'Read More' and scroll through these sections below to help understand what you will experience during your training at the police academy. Physical training in the academy is challenging and is meant to prepare you to be in the best shape possible before beginning your career on patrol. Cadets will engage in regular physical training beginning the first week of the academy and it will last throughout the duration of the academy, becoming increasingly complex. The conditioning you begin with and maintain is meant to put you in the shape you’ll need to be in to properly learn other skills such as defensive tactics and to also learn your physical limitations. In addition to a variety of physical conditioning exercises and skills training requiring great strength and cardio shape, cadets must also complete a physical fitness test (timed 1.5 mile run and 500 meter sprint row test) with a minimum 80% average to graduate the police academy. Cadets must maintain an 80% average on all exams in order to graduate the police academy. Do not underestimate the amount of studying necessary to successfully pass your exams! We lose a number of applicants because they were not mentally prepared or hadn’t taken proper measures to create better study habits prior to entering the academy. Cadets will learn through classroom instruction, hands on/partner training, and will later apply these skills to scenario-based training/role play. All skills are taught by certified and highly experienced instructors who recognize that skill levels vary among police cadets. Ultimately you will be assessed and scored for each skill and for your ability to make decisions throughout role play scenarios that are in accordance with Department policy, Texas State laws, as well as our guiding principles. As with all other exams and physical testing, you must maintain an 80% average to graduate the police academy. Both the Austin Police Department Regular and Modified Academies are extremely physically and mentally challenging and should not be underestimated. Cadets engage in classroom instruction, work on projects, conduct physical training, skills training, and take a number of exams throughout the duration of the academy. The number one reason we see cadets fail is because they were not properly prepared mentally, physically, or sometimes even emotionally for the intensity of this long-term training. Read through some of our tips below to make sure you’re well prepared for this rewarding commitment. We want to see you succeed! In addition to the initial physical fitness test which applicants are required to pass at a 70% rate during Phase I Testing and at an 80% in the academy, police cadets are required to participate in a lot of physical training. This includes, but is not limited to: sprinting, jogging, squats, push-ups, sit-ups, carrying weight overhead, planks, and intervals. We highly recommend that potential applicants begin an exercise regimen that includes cardio exercise prior to or at the time of application and to remain consistent with your training throughout the hiring process. An effective regimen should include High Intensity Interval Training (HIIT) or CrossFit style workouts. Prospective or current applicants should also utilize a row machine on a regular basis since being hired and graduating the academy are partially based on your row performance. The Austin Police Department uses Concept 2 rowers on the number 5 setting for these tests. Studying self-defense, especially a form that includes grappling or ground wrestling, prior to the academy is not required but is encouraged if it would make you feel more at ease mentally. Our Training Academy instructors realize that not everyone has engaged in a physical fight and will teach hours upon hours of defensive tactics to make sure you are capable of properly protecting yourself before graduating the police academy. While fighting isn’t necessarily something that happens often in policing, it is important that you are capable of protecting yourself and others. Between the 40 hour weeks at the academy and the hours you’ll spend studying, the academy can become very stressful, very quickly. We recommend trying to find ways to minimize your stress prior to entering the academy – whether that means lessening your financial obligations, finally repairing the crack in your ceiling, etc. Once you begin the academy, you’ll find that you have very limited personal time or energy for much else. It is a serious commitment and takes your best effort. Additionally, finding healthy ways of coping with stress way before the stress arrives will help ensure that you’ll be successful. You can do this! If you’re used to working independently, that’s okay, but realize that policing relies on teamwork and camaraderie. Your peers in the academy will become your friends, study partners, and possibly much later, maybe even your supervisor or subordinate. Understanding the importance of working as a team is essential for a successful career in law enforcement. Need to work on it? Join a team sport or ask to be part of a group project at your current job. Studying every week in the academy is crucial. You will cover a large amount of material in a short amount of time. You’ll be asked to memorize information as well as apply it to scenario-based training. You will also be quizzed regularly and will have to maintain an 80% average on your exams throughout the academy. If you’ve never been to college, learning new study habits can be especially difficult. Start now by creating evening and weekend routines for yourself that include dedicated time to an activity (if you don’t already do this). Carving out time and sticking to a schedule will ensure that you’ve created discipline for yourself which will pay off for you in the academy later. Prospective applicants are encouraged to participate in the Ride Along Program prior to applying, if possible. All police officer candidates must complete a ride along with an officer toward the end of the hiring process. Any citizen or applicant wishing to participate in the program can obtain information by contacting the Public Information Office at 512-974-5017 or by viewing the printable or electronic application forms online. Be sure to plan ahead! We maintain a waiting list and it may take up to 4-6 weeks to schedule your ride. My name is Erica Danielle and I have been with the Austin Police Department for 12 years. During those 12 years I have been assigned to central west Austin, Court Services, and now work in historic East Austin as a District Representative. District Representatives are a specialized unit of officers who are assigned to each of four regions within the city. I was born and raised in Austin, Texas, on the east side of the city. At a young age, my desire to become a police officer grew. I vividly remember playing cops and robbers with my cousins and friends. I enjoyed the thrill of being the officer…chasing, instead of being the robber who was always running away and hiding. I was born and raised in the Austin area by paramedics and a fireman, so public service has been in my blood since the very beginning. In high school I knew I would pursue a career in the public service realm but I wasn’t quite sure at that point what it would be. After obtaining my EMT and working in a local hospital emergency room, I quickly learned medicine was not in my future. 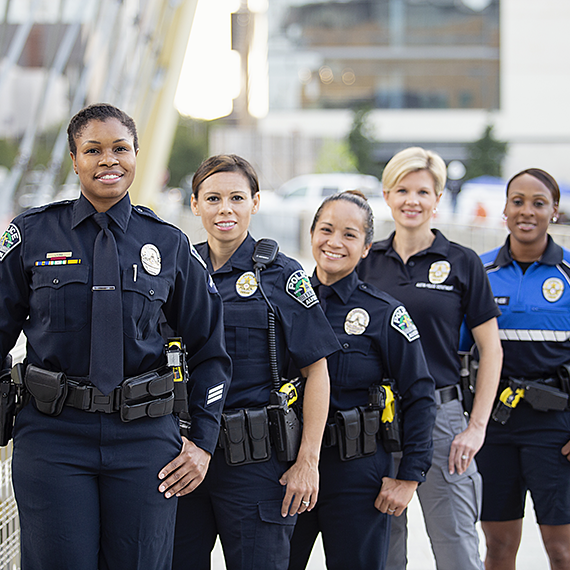 I first joined the Austin Police Department as a civilian employee in the Financial Management Department. At my interview with Finance I expressed my interest in becoming a police officer someday. I didn’t have any family or friends in the field at the time so I wanted to spend time as a civilian before I made that decision.